Hope you’re well and thank you for delivering your course on OpenLearning. We’re writing to let you know about some important upcoming changes to OpenLearning’s pricing for educators, that will take effect in the next 30 days. 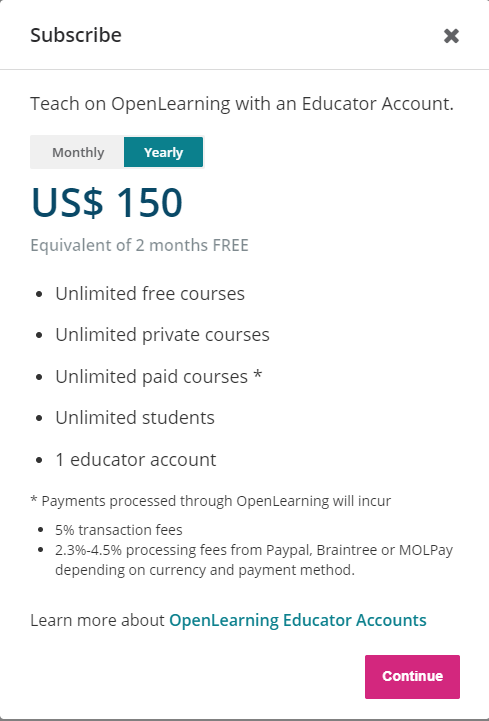 For the past six years, we have enabled anyone in the world to create and deliver a course on OpenLearning for free. While this approach enabled many people around the world to run courses on OpenLearning, it has been a challenge for us. We’ve incurred significant costs for hosting, fighting spam and providing free customer success, and it has hindered our ability to add new features to the platform that would benefit all students and educators. Therefore, in order to ensure we can continue enabling educators to use OpenLearning, we will now require all course creators, administrators, teachers and facilitators to subscribe to an ‘Educator Account’ within the next 30 days. If you run paid courses, we are also reducing our transaction fees from 15% (previously inclusive of both transaction and gateway fees) to 5% transaction fees plus payment gateway fees of 2.3% - 4.5%, which means you keep more revenue from course sales. These fees do not apply to educators who are attached to an educational institution that has an agreement with OpenLearning. If you’re delivering courses on behalf of an educational institution then you should contact the institution so that they can link your account to their OpenLearning institution. We’ll continue to do our best to support educators in designing great courses and in 2018 we rolled out a new educator support site, automatic portfolios, native mobile apps and much more. We’re excited to continue bringing you fantastic new features and updates in 2019, inline with our vision to transform the world through social learning. All existing educators will receive a 30-day free trial period starting today (February 4th 2019). To subscribe to an Educator Account, click the subscribe button on the banner inside your course at any time during your trial. To learn more about what is included with an Educator Account, click here. What happens if I don’t subscribe? Thanks again for your support and feel free to let us know if you have any questions. Will the free courses still be free for students? How does the pricing work exactly? I assume it’s $15 per month. Can one pay in advance for, let’s say, 5 years to keep the course online? And would that be eligible for some kind of discount? Gideon Wentink Hi! Yes, if you created a free course, the course stays absolutely free for them. Yes, it is 15 $ per month, but you can also choose to opt for yearly subscription instead of monthly. If you pay by credit card, the yearly subscription will be renewed automatically. Educator Account pricing subsciption will cover all this courses or only one course ? PERMATA Kurnia Hi, thanks for your query! All 3 courses will be covered under a single educator plan, provided at least one of the course admin has an active Educator subscription with us. Hi, I keep emailing to get access to take off my course but I get no reply. I didn't receive this information and now I can't access my course. Please can someone respond to my emails and enable me to access and download my course content. Zen Holmgren Hi Zen, we received a message from you on 22 March which was replied by our Omnaya on the same day. We did not receive any other messages from you. Could you please resend it? Thanks!